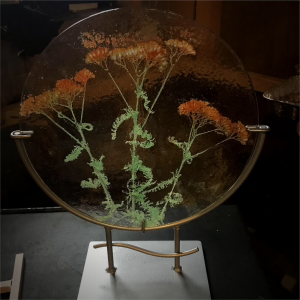 Kiln fired (fused glass) art objects that capture the beauty of nature. These flowers, feathers and other natural items will never wilt or fade. Immune to the ravages of time, like insects trapped in amber, they are as immortal as one can be. Actual flowers and feathers have been used in the creation of these works. They are pressed and then coated with powdered glass using a process called Fossil Vitra. Once coated, a piece of sheet glass is placed over the top, and the piece is carefully fired over a 12 hour span, with the maximum temperature reaching 1220 degrees. During the firing process, the natural matter burns off leaving only it’s ghost behind. Once fired the pieces may be hand filed or ground down to perfect the shape and remove any sharp protrusions. A second firing is sometimes necessary to add shine or to shape the piece into a dish. This final firing must also be carefully regulated, slowing heating and cooling the pieces over 12 hours.